This is completely maddening. But that doesn’t make it less true. Like most ethnographic museums, the Tropenmuseum’s roots are complicated. It opened to the public in 1871 as a demonstration of the Netherlands’ colonial riches. It was a museum of conquest and exoticism. By the 1940s, the Dutch empire faded, and the museum morphed into a showcase of the world’s cultures from a Eurocentric point of view. Every twenty years following, the Tropenmuseum changed. In the 1960s and 1970s, they addressed worldwide social issues. In the 1980s and 1990s, they embraced multi-culturalism. By the time I showed up in 2008, they had taken a post-modern approach, grappling with the roles of Dutch and other white colonialists in the cultures and stories on display. As someone with no experience in anthropology, I was fascinated by this whirlwind tour of trends and movements in the field. The Tropenmuseum was unapologetically working—at considerable expense—to ride the wave of relevance as societal and academic perceptions shifted over time. On the level of an institution, this movement is admirable. The Tropenmuseum, a venerable old museum, was committed to change that would make it relevant to modern times. They recommitted again and again. Institutions seem to approach the shifting tides of relevance in three ways: they embrace them, they fight them, or they equivocate over them. 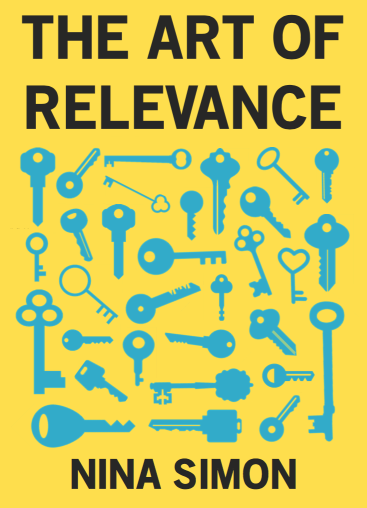 Institutions that embrace the challenges of relevance invest in their potential. They raise the money, garner the political will, and change as needed. Sometimes the changes hit the mark, and relevance surges. The institution shines for a new day, like the Silk Mill in Derby. Sometimes they miss, and hard-working changemakers end up exhausted and disheartened. Institutions that fight against relevance ignore its potential impact on their work—sometimes to their peril. They stay obstinately, unapologetically unchanged, hoping their dedicated insiders will keep them going until the pendulum swings back in their direction. They may even be able to attract new supporters who appreciate permanence. They might survive. Or not. But the institutions I worry most about are those that equivocate. Many institutions take a schizophrenic middle ground on relevance. They swing between issuing press releases about change while reassuring insiders that none of the good stuff will be impacted. They pat themselves on the back in the morning and go to bed fearful at night. I don’t know about you, but I want to sleep well. So I try to know myself, to know our mission, and to be honest about our intentions in the face of change.